Nikon has said that it looked into including Wi-Fi functionality for the D800, but believes that current Wi-Fi speeds are too slow for the commercial market. Currently, there are no DSLRs on the market with WiFi technology built into them, but several adapters and add-ons are available. Recently, Nikon launched the D3200, a beginner level camera which has an optional Wi-Fi accessory costing around £55. Presently, the W1-UA only works with the D3200 and gives photographers the opportunity to control the camera via a mobile device and share images online. Speaking to TechRadar, James Banfield from Nikon UK said, "In the commercial environment, it's not fast enough - pros want it to work within a second." Although the D800 is pitched as a professional level camera, there will be lots of enthusiastic amateurs likely to buy the model too. "It's the kind of thing we would feedback [to Japan], what people are doing with the camera, and what they would like to see," Banfield said. "Photographers can always see an application for it, but on a day-to-day basis it's not something that would appeal." Currently, if a D800 user wants to use WiFi to transmit images, they can purchase a Nikon WT4 wireless transmitter, which costs around £550, or use an Eye-Fi SD memory card. The camera does not work with the newer WT5, which was announced with the Nikon D4. 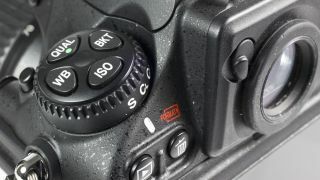 With several camera companies now including WiFi as standard in selected models, it seems only a matter of time before DSLRs also offer such functionality, without the need for expensive additional extras.